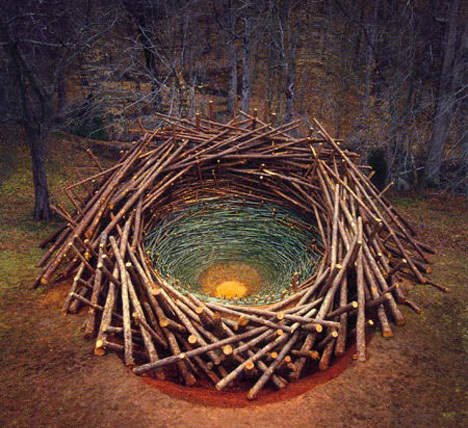 Bavarian artist Nils-Udo has been working directly with nature since 1972 creating site-specific pieces using natural materials. Sketching with flowers. Painting with clouds. Writing with water. Tracing the May wind, the path of a falling leaf. Working for a thunderstorm. Awaiting a glacier. Bending the wind. Directing water and light. The May-green call of the cuckoo and the invisible trace of its flight. Space. The cry of an animal. The bitter taste of daphne. Burying the pond and the dragon-fly. Setting fire to the fog and the perfume of the yellow barberry. Marrying sounds, colors and smells. The green grass. Counting a forest and a meadow. 1972: The sensations are omnipresent. Being a realist I just need to pick them up and release them from their anonymity. Utopias are under every rock, on every leaf, behind every tree, in the clouds and in the wind. The sun’s course on the days of equinox; the tiny habitat of a beetle on a lime leaf; the pointed maple’s red fire; the scent of herbs in a wooded gorge; a frog’s croak in the water lentils; the primrose’s perfume on the banks of a mountain creek; animal traces in the snow; the remaining trajectory of a bird darting through the woods; a gust of wind in a tree; the dancing of light on leaves; the endlessly complex relationship of branch to branch, twig to twig, leaf to leaf. Everything perceivable through human senses takes part. Natural space experienced through hearing, seeing, smelling, tasting and touching. By means of the smallest possible interventions, living, three-dimensional natural space is re-organized, unlocked and put under tension. Reorganisation, of course for a finite period of time. One day, the intervention is wiped away, undone by nature without leaving a trace. Clearly it is only in her very last refuges that nature is still intact, inexhaustible; it is only there that enchantment is still reality. On any day of the year, in every season, in any light, in any weather; in the Largest and Smallest. These days however, people are not interested in this. Nature is no longer an issue, except to a few Greens, who mostly can no longer tell a lime tree from a beech tree. Of course, there are many who pretend to love nature. Like the ones who claim to want peace. The fact is, they lost nature long ago. They don’t see it any more, let alone hear it, smell it , taste it or touch it. When they do in fact take a look, they still don’t see: they lost the prerequisites long ago for a larger, expansive and transitory overall view. Documentation of a world experience becoming extinct. Providing evidence at the last possible moment of a life-awareness seemingly anachronistic. An attitude hardly conceivable, even to the well intentioned. A basic idea is to achieve absolute purity. Nature performs a demonstration of itself. Every non-natural element is ruled out as impure. No other materials are used than those found in each natural space. The characteristics, the respective possibilities for processing, and the character of the natural space itself plays the major role in determining the shape of the work. Botany, collecting, preserving and displaying: the overwhelming abundance of natural phenomena can often only be catagorized under small or the most minute fragments of their inherient structures. The element of time. Already in 1972, my first work in the Chiemgau Alps consisted of a planting. By installing plantings or by integrating them into more complex installations, the work is literally implanted into nature. As a part of nature, the work lives and passes away in the rhythm of the seasons. Even though I work in parallel with nature and create my interventions with all possible caution, they will always remain a fundamental contradiction to themselves. It is this contradiction on which all my work is based . Even this work cannot avoid one fundamental disaster of our existence. It injures what it draws attention to, what it touches: the virginity of nature. To unite, condense and amalgamate the specific possibilities of a landscape at a given season to form a unique pinnacle, the apotheosis of that season in that landscape. Implementing what is potentially possible, what latently exists in nature, to literally allow what never existed but was always there to become reality; the ever present – Utopia. Even one second of a lifetime is enough. The event has happened. I have awakened it and made it visible. Make natural space into Art-space? Where is the limit on the narrow line between nature and art? Art? Life! What counts is the utopian character, the life- and art-blending character of my actions. My response to the events that mark my existence. My life. Are there art-lovers interested in my life? A picture. A leaf, laden with flowers, drifting down a brook. Life.